Over on Violets Pantry we have started a fortnightly challenge. Members take turns setting 3 recipes for others to cook and we have a fortnight in which to make them and post pictures/feedback. The first challenge was for Finger Licking Chicken Wings, Macaroni Cheese and Apple and Almond Gallette. 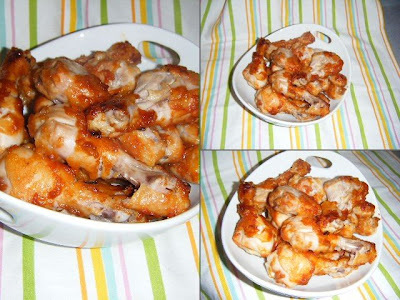 I made all three, but the winner recipe for me was the the Finger Licking Chicken Wings! I made them with drumsticks and they were delicious. 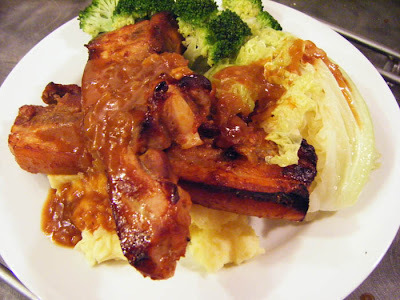 Then I got to thinking that the sauce would go really well with pork too, so slathered it all over some lovely pork slices, served it with mashed potatoes, braised savoy cabbage and brocolli! What a fab, finger licking meal. Thanks for the recipe Pi, this will go in the keeper file! 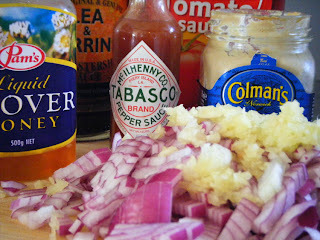 Heat the oil in a small pan and cook the onion and garlic for 3-4 minutes until softened. 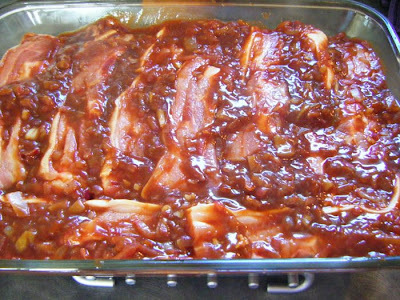 Stir in the honey, ketchup, Worcestershire sauce, mustard and Tabasco and simmer very gently for a minute or so. Dust the chicken in the seasoned flour then brush liberally with the sauce. Place on a baking sheet and roast for 30 minutes until well browned and cooked through. Transfer to a serving plate and keep those napkins handy, or just lick those fingers! For the pork, I sat the slices in the sauce for a few hours before cooking (I used approx 1 kg of slices) then into the oven at 160C for 45 mins (covered with foil), then took off the foil and upped the temp to 200C for 15 mins. Gosh, you are making me sooo hungry! My mouth is watering!